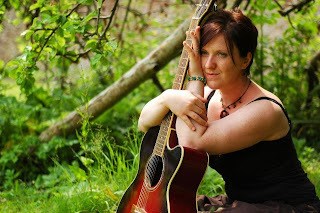 Ange Hardy is well known for being a brilliant songwriter and singer. 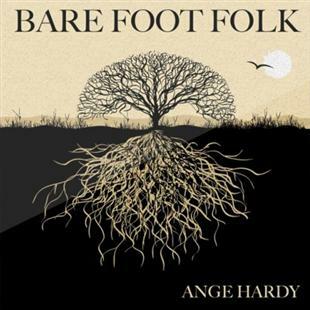 Her second album, ‘Bare Foot Folk’, is a collection of 14 beautifully crafted songs written by Ange. All her songs contain interesting and engaging lyrics set to wonderfully fitting tunes, mostly accompanied by her delicate guitar playing. Although none of the songs are from traditional sources, many of them narrate tales and are set to tunes that could easily be mistaken for traditional. The aim of the CD, for me, is very clear – and that is to present stories simply but beautifully and not concentrating on the instrumentation but the tune and the words. Her guitar playing is immaculate and very fitting for the album, with the vocal harmonies at times enhancing the messages that the songs convey. Furthermore, Ange has a beautifully clear voice which is ideal for the story telling aspects of her songs as well as being incredibly pleasant to listen to. One of my favourite songs on the album is ‘Crafty Father John’. Ange’s catchy tune gives the song a very traditional sound; however, her witty lyrics carry a very modern message about Facebook and inappropriate status updates. It sounds like one of those songs that you heard before, but it is completely original in words and in tune. I particularly love the guitar accompaniment for this song, as it adds a strong rhythmic structure. Another song in which Ange demonstrates exceptional song writing is ‘White As Snow’. It is inspired by a scene in the film ‘Another Earth’ which is an incredibly strange fantasy about a second planet Earth appearing in the sky. Anyway, in the song I think Ange has really captured the abstract, surreal mood of the film. The harmonies in this song are absolutely beautiful. It is sung unaccompanied which gives the song an incredibly icy, eerie feel that matches the lyrics and the story the song tells. ‘It Can't Be So’ is a song about impossible love but uses many images from traditional songs. It is very clear that Ange Hardy enjoys these traditional images. I really like how Ange paints the scene at the beginning of each verse. The chorus for this song is particularly catchy, guaranteed to get you singing along. Furthermore, Ange's impressive harmonies add texture to the tracks. I have to say that I was amazed by the 10 part harmony during the chorus of the song ‘Forlorn Land’ which is extremely effective in transforming the song into a battle cry. Also, it enhances the idea that perhaps to be heard you need to be many voices which is sort of what the song is about. ‘The Storm Has Now Begun’ is a sea shanty with overlapping lyrics, making it really interesting to listen to. It has a very traditional feel due to the rhythmic bodhran drum accompaniment. One great aspect about the CD is how the songs link together. Sometimes the links are obvious, (especially if you read the sleeve notes), such as ‘Away With You Lassie’, ‘The Old Maiden’ and ‘The Storm Has Now Begun’ which are about life and tragedy at sea as well as the people left behind. But other connections are more subtle like ‘Young Martha's Well’ and ‘Stop Your Crying Son’ which both have associations with parenthood – a natural subject for Ange, a mother herself. I think these links gives the album a sense of completeness, suggesting it should really be listened to in sequence rather than on 'shuffle'. It is certainly true to say that no song disappoints and I am fond of every single one!